Jean B. Crockett is Professor and former Director of the School of Special Education, School Psychology, and Early Childhood Studies at the University of Florida. She is an experienced school principal and special education administrator. Bonnie Billingsley is Professor in the Department of Teaching and Learning at Virginia Tech. She has provided leadership for special education as a department chair at two universities and as an administrator in K-12 schools. 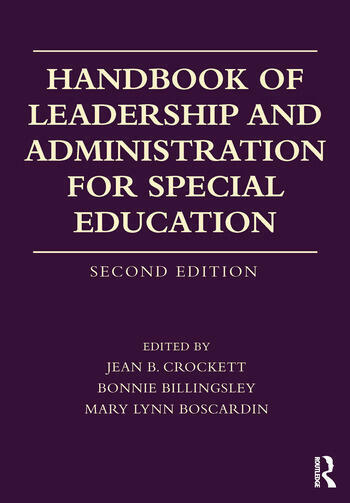 Mary Lynn Boscardin is Professor in the College of Education at the University of Massachusetts Amherst, President of the Council for Exceptional Children (2019), and Editor of the Journal of Special Education Leadership.